On Thursday 4 April 2019, our Foundation published an article describing how, due to the growing problems following Bayer’s takeover of Monsanto, the company’s situation could lead to desperate acts. We pointed out that Bayer has already lost two court cases in which glyphosate, the active chemical in its Roundup weed killer, was found to have caused cancer, and that a further 11,000 lawsuits have now been filed against the firm, thus endangering its future existence. But Bayer’s biggest nightmare is not glyphosate – it is the role this German pharmaceutical and chemical flagship played as the economic driving force behind two world wars. For over a century now, Bayer must have spent hundreds of millions of dollars to prevent its criminal past from getting into the textbooks of history. The real danger of the glyphosate lawsuits for the company is that legal records from the 1947-1948 Nuremberg War Crimes Trial will surface – and break eight decades of silence about Bayer’s essential role behind the Nazis rise to power and the German world conquest plans during WWII. Not surprisingly, within 48 hours of it being published, more than a quarter of a million people from around the world read our message last week. Bayer was apparently then forced to launch a ‘charm offensive’. Four days after our article was published, it announced it was finally releasing studies on glyphosate’s supposed safety that had been hidden from the public. With this move Bayer apparently wanted to score some credibility points with an increasingly skeptical public. The perceived message was ‘we are transparent – you have to believe us.’ The problem is that this PR strategy does not just come from an arbitrary company – it comes from Bayer, a company with a century-long track record of disinformation deception and crimes against humanity. The seriousness of the situation Bayer finds itself in, and the growing number of areas in which it is under attack, should not be underestimated. In an analysis published on 8 April, the Wall Street Journal (WSJ) stated that Bayer faces a “legal reckoning”. Writing that plaintiffs’ lawyers say research on Roundup was skewed by Monsanto collaborating with (supposedly) independent scientists who conducted the weed killer’s safety studies, the WSJ described the mounting lawsuits alleging a link to cancer as one of Bayer’s biggest liabilities. Thus, the alleged ambiguity about the toxicity of glyphosate can be summarized as follows: The closer its ‘safety’ studies were associated with Monsanto/Bayer, the more harmless was the substance. Vice versa, the more independent the research was – including studies from our own research institute – the more the true nature of glyphosate as a toxic and carcinogenic substance becomes obvious. Bayer has a proven history of suppressing data on the dangers of its products. 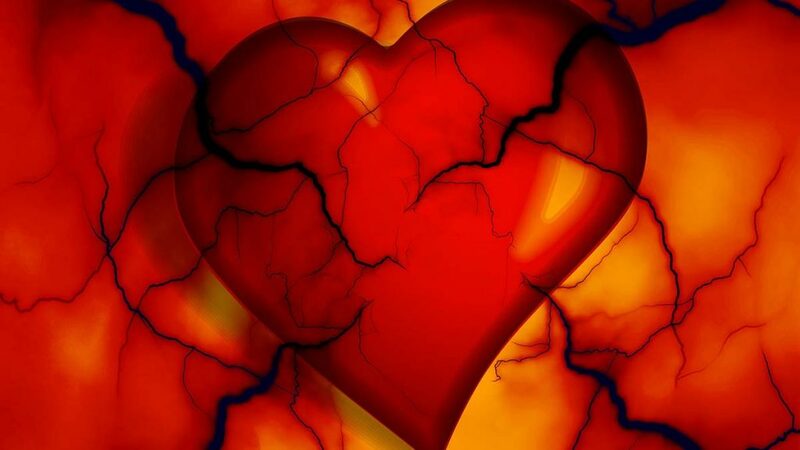 In August 2001, after it was discovered that Baycol/Lipobay, its cholesterol-lowering statin drug, was linked to the deaths of 31 patients in the United States, it withdrew the drug from sale. Papers discovered later indicated that, long before it was pulled from the market, senior executives at Bayer knew the drug had serious problems. As reported by the New York Times in 2003, emails, memos, and sworn depositions suggest Bayer had promoted the drug while knowing patients were falling ill or dying from it. In all, around 100 deaths worldwide are believed to be linked to Baycol/Lipobay. In September 2006, further demonstrating a pattern of Bayer suppressing drug data, the United States Food and Drug Administration (FDA) announced the company had failed to reveal the results of a large study suggesting that Trasylol, a heart surgery drug it produced, might increase the risk of death, serious kidney damage, congestive heart failure, and stroke. Bayer subsequently admitted suppressing the study, claiming it had been done “mistakenly”. It is estimated that had Trasylol been withdrawn from the market earlier, 22,000 lives could have been saved. Given its historical record of suppressing data on the dangers of its products, it is clear Bayer cannot be trusted over its assertions that glyphosate is ‘safe’. In this respect, it should be noted that Monsanto itself is alleged to have been suppressing evidence of the weed killer’s cancer risks for years. That Bayer, presumably aware of this, could happily purchase Monsanto, a firm widely described as the most hated company in the world, speaks volumes. 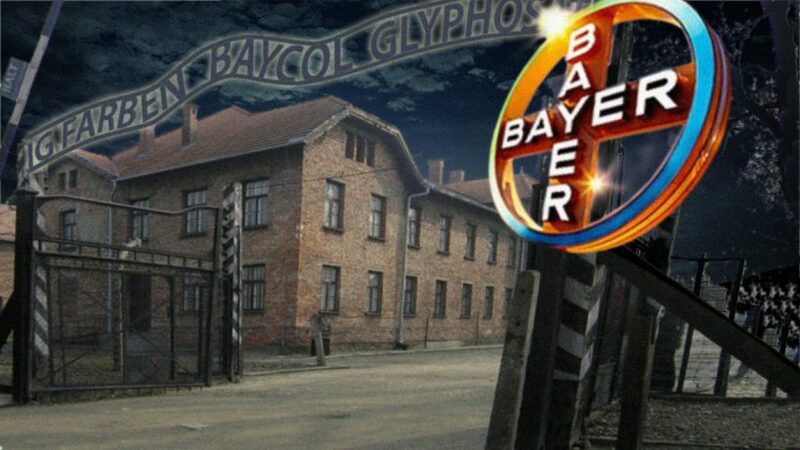 Of all its crimes, Bayer’s roles in IG Farben, Auschwitz, and two world wars are the ones it has seemingly tried hardest to suppress. To this day, the shocking facts about its involvement in these murderous aspects of history remain notably absent from its website. During WWI Bayer was involved in the development and manufacture of a range of poisonous gases, including mustard gas. These chemical warfare agents were used to devastating effect during WWI and became the planet’s first weapons of mass destruction. In WWII, as part of IG Farben, Bayer helped create the largest chemical cartel in the history of Germany. Its patented drugs were tested on inmates of Auschwitz and other concentration camps, who were used as guinea pigs. These tests were conducted by the likes of Dr. Helmuth Vetter, a Bayer employee and Nazi Party SS doctor at Auschwitz. 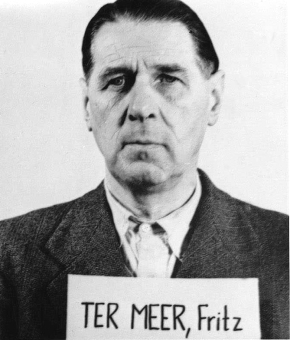 After the war, Fritz Ter Meer, a director of IG Farben, was sentenced at the Nuremberg War Crimes Trials to 7 years in prison for crimes against humanity that included mass murder, slavery, and plunder. Released after serving only 2 years, he went on to become chairman of Bayer’s supervisory board. 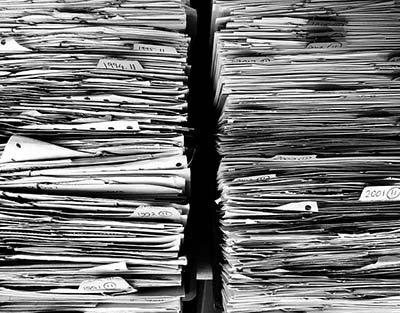 Many U.S. states have what are known as habitual offender laws. Commonly referred to as ‘three-strikes’ laws, they require people found guilty of more than two serious wrongdoings to serve a mandatory life sentence in prison. Were there an equivalent law in the corporate world, Bayer would surely qualify to be subject to it. The company’s purchase of Monsanto tells us that, just as it has always done, it continues to place profit over life. If we are truly to reach a world of health, peace and social justice in the twenty-first century, companies such as Bayer that are habitual offenders against the interests of humanity should have no place in supplying our medicines and foods.